This elegant dessert is rich and creamy and yet it’s also low in fat and gluten free. I’ve found this recipe at BBC Good Food, you can find the recipe here. Whenever I make this, my friends think it’s store bought because it looks so good and tastes even better. The hardest thing about this dessert is only eating one slice! remember, it’s supposed to serve six. Preheat your oven to 150C/ gas 2/fan 130C. Meanwhile, line a 11×8 inch baking tray with non-stick baking paper. Beat the egg whites with a hand whisk until frothy and it has doubled in size. Carefully add caster sugar and continue to whisk until the mixture is thick and shiny. Add the corn flour, vinegar and vanilla extract. Add to the egg whites and whisk once again. Spoon the mixture into the tray so that it is level. Do this carefully to avoid pushing the air out. Bake for thirty minutes or until the meringue surface becomes slightly firm to the touch. Carefully remove the tray from the oven and cover with greaseproof paper for ten minutes. Sprinkle a fresh sheet of greaseproof paper with icing sugar. Put the damp paper aside and carefully place the meringue on to the sugar-coated paper. Remove the lining paper and then spread the yogurt over the meringue. Scatter with the mango and passion fruit. 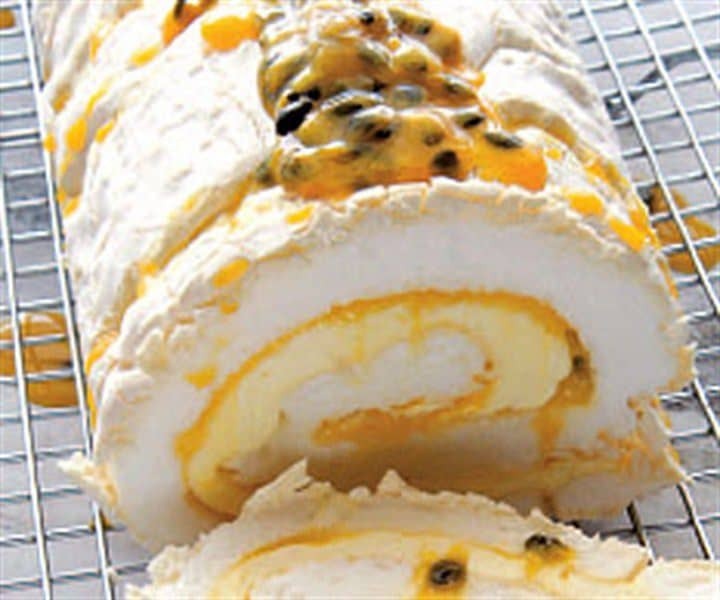 Roll up the roulade from one of the short ends. Keep the join underneath and out of site. Sprinkle a little sifted icing sugar on top for decoration. Serve with raspberry sauce or fresh cream. More information about this recipe can be found at the original source her. More desserts and also, meals, dinner and recipes for kids. All Gluten-Free and all 100% Free, my favorite recipes here.